Call4Peace offers top-notch email marketing services to its clients. With a track record of successfully satisfying the marketing needs of innumerable clients, our expertise can be relied upon to send your list of clients through the roof! From devising campaigns to generating address lists, our service covers all the facets of email marketing. Conversion of Leads into Customers, Guaranteed! According to Radicati's 2016 Email Statistics Report, around 3 billion people will be using email by 2020. The importance of email in the realm of marketing is increasing day by day. The fact that about 75% of all the emails sent are read by their recipients is convincing enough to make any marketer realize the importance of making full use of this brilliant channel. 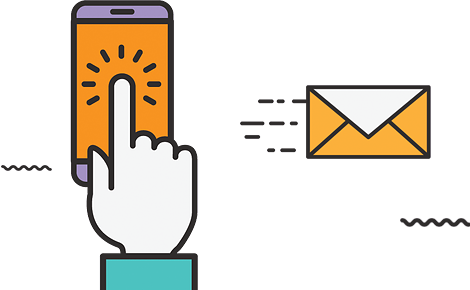 Call4Peace understands the significance of email marketing, which is why our services, some of which are mentioned below, are designed to provide promising results. Our email marketing campaigns promise amazing results, attracting new clients every day. We provide smart auto-responding options that help create follow-up emails instantly. We are available around the clock to assist you in any way possible and to satisfy your queries. There is a reason why Call4Peace provides the best Email Marketing services in town and that is our systematic approach. Here's a glimpse of how we work our magic. We begin by devising an innovative email marketing campaign. We make a list of all the recipients. Invalid email addresses are checked off from the list. Non-offensive and/or illegal elements are avoided at all costs. We incorporate the latest techniques and tools in bulk emailing. Our innovative solutions are simply unmatched! Get Our Awesome Services Today and Watch Your Business Reach New Heights! Waste no time - get our outstanding email marketing services today, convert your leads into loyal clients, and show your competitors who's boss!